Finances are a big stressor in everyone’s life, but more so when your fighting for your child’s health and well being. We believe that child needs their parents more than ever at their time in need, and their parents shouldn’t be stressing bills during that circumstance. A single bill paid, for example, car payment, electric bill, rent, means more that money. It means that the parents can spend another week or so with their child, giving them the love and support they most desperately need during their chronic illness. There are so many families that need our help, but we can only assist them with your help! Please consider making a donation to our foundation. We promise that your money will help these families stay family strong. EVERYONE CAN HELP SOMEONE. A FAMILY IN NEED WILL BE FOREVER GRATEFUL! 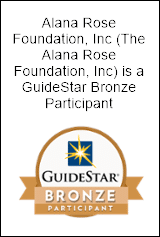 The Alana Rose Foundation, Inc.